I planted a garden because it brings me disproportionate joy. Watering the plants is my worship. The smell of the water from the garden hose, the way my thumb shakes with exertion from making the water spray wide, to the way the cold droplets play rat a tat tat on my feet. I lose myself in the unhurried caretaking of the plants that will contribute to feeding my family. Some nights after I shuck my work clothes, I pad out to the fenced garden and stoop low between the massive blooms and vines. I leave language behind and slip into a world of sounds and smells, textures and tastes. I pretend that some of the deadlines and obstacles are gone. I am simply responsible for pulling the weeds from the earth and for securing the mesh to keep the critters away. The work is not finite, but it is deliberate and without emotional complexity. This morning I shared this photo on Instagram because I thought it was fun. I share it with you now because it seemes to have struck a happy chord with people. And I want that for you. 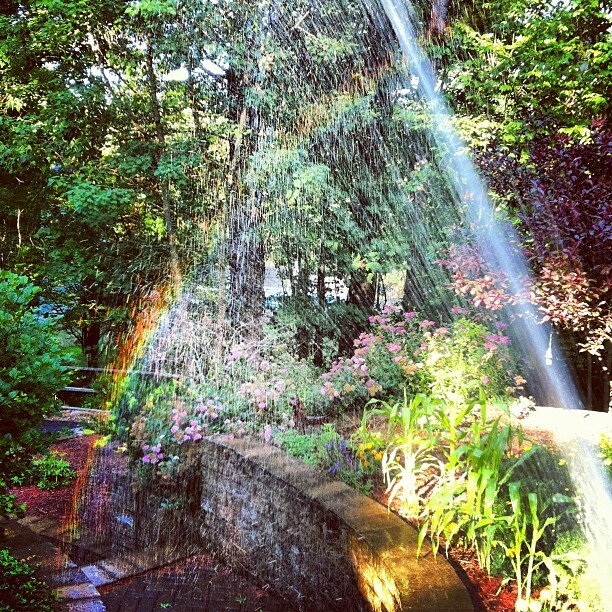 Never stop chasing rainbows or playing with garden hoses. That is so gorgeous! I have a garden of potted plants, and I step outside to water them while my boys eat breakfast each morning. It’s my five minutes of utter peace and quiet to start the day, and I love it so much. It’s precious to have that outdoor ritual, isn’t it? I was thinking about how you said it’s your worship, and I realized that it is a very spiritual, quiet time for me, too. Oooh – water, flowers and greenery – it’s life! The rainbow is just a lovely bonus. Exactly, and it’s my girls who keep me light enough on this earth to remember to see the rainbows. I garden because it brings me escape. No, wait … not escape. The only thing better than experiencing something like this is sharing it and seeing the ripples of joy. indeed that is why. lovely picture. My mom and I joke that our gardens are the cheapest therapy. There is something so magical about the soil, water, wind, and plants, it helps me connect back to a part of myself that is so easily lost in everyday life. I’m so glad you have a garden, too. going out to turn leaves, check for new harvest and do a general garden status check with my morning coffee is one of my favorite weekend activities. we’re starting to roll in zucchini and herbs around here. the tomatoes and peppers aren’t far behind!